Every year I go into overdrive right before the holidays. Somehow, no matter how much I plan ahead, I am always running around last minute trying to finish everything in time. For that reason I’m going to keep this post sweet and to the point. Let’s talk about eggplant lasagna noodles, the healthier, low-carb and grain-free answer to everyone’s favorite pasta. I promise you won’t miss the traditional wheat noodles with these bad boys! Alright, I have a confession. Today’s post was supposed to be about an entire lasagna made from these eggplant lasagna noodles. I had three pounds of roasted eggplant noodles cooling on the counter this morning, and when I came back into the kitchen to assemble to the dish they were gone! My insane puppy Stella must have jumped on the counter and ate them. All of them! First of all, the counter is about 3 1/2′ and there are no chairs next to it. I had the eggplant cooling about 8-10 inches from the edge of the counter which means the crazy puppy somehow jumped onto the counter and ate the entire plate before jumping down! Honestly, I was more impressed than mad. That’s skill! It did pose a problem for me to get pictures of the final dish, so I decided to just share the eggplant lasagna noodles with you instead. After all, they are what make it special. Simply sub wheat noodles for these eggplant noodles in your favorite lasagna recipe and voila! Get an extra portion of veggies while cutting the calories and carbs, all while adding extra flavor. These eggplant noodles are roasted until tender and coated with italian seasonings and pecorino romano cheese. They are pretty darn good straight out of the oven. I like to make a few extra so I can snack on them while assembling the lasagna. Every year for Thanksgiving my family has lasagna. I still can’t figure out while we still make a turkey because everyone fills up on lasagna. Honestly, if someone gave you a choice between turkey and lasagna, would you really choose turkey?! 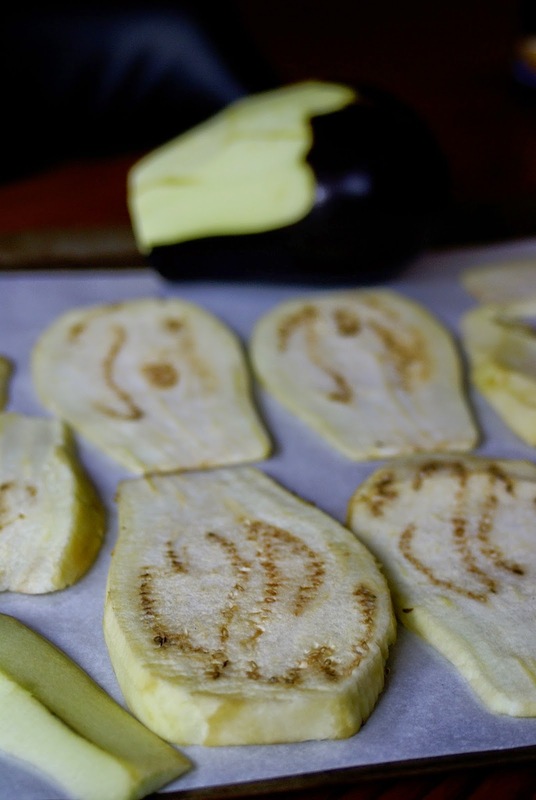 Before you reach for the wheat noodles to make lasagna, grab an eggplant instead and start slicing. Make your lasagna healthier (and tastier) this holiday season. 1. Preheat oven to 375 F. Line two large baking sheets with parchment paper. 2. Slice the eggplants thin, about 1/4″ thick or as thin as you can get it. Lay the slices out on the prepared pans. 3. Mix the garlic powder, parsley, basil, salt, pepper, and olive oil together in a small bowl. Using a pastry brush, gently brush a thin layer of the oil mixture on both sides of the eggplant noodles. 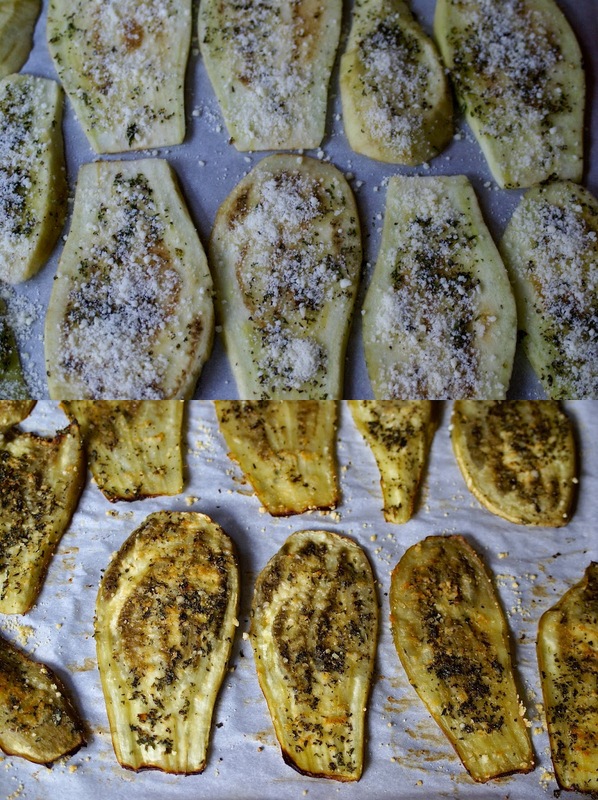 Sprinkle both sides of the eggplant with cheese before putting them in the oven. 4. Bake for 15 minutes, then remove from the oven and flip each piece over. 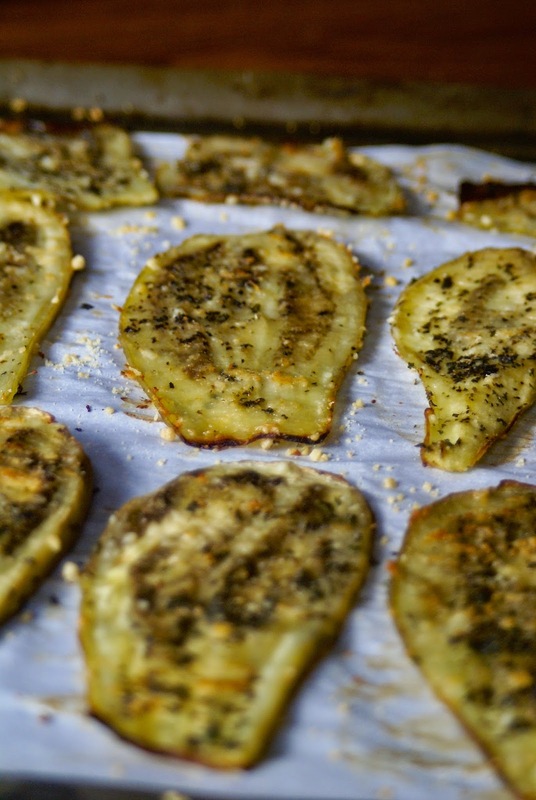 Return to the oven and bake for another 5-10 minutes, or until the eggplant is tender and the edges are golden brown.